VERY RARE TUNISIAN WEDDING CAPE known locally as a "Bakhnuq" and given as a gift by the groom to his bride. 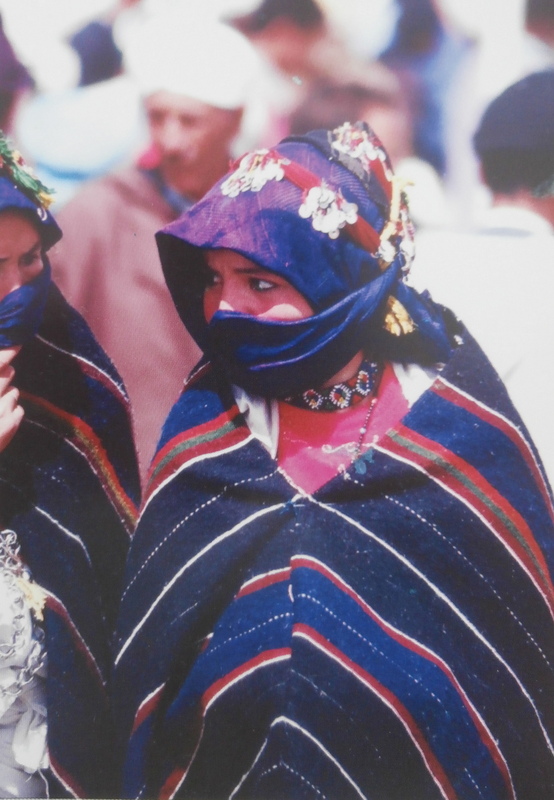 Although bought in Tunis in 1981 these fine capes are woven in the small towns of Cabes and Tataouine in the south east of Tunisia. They are always woven with red, blue or black fine wool and embroidered in cotton with designs which symbolise the bride's jewellery. 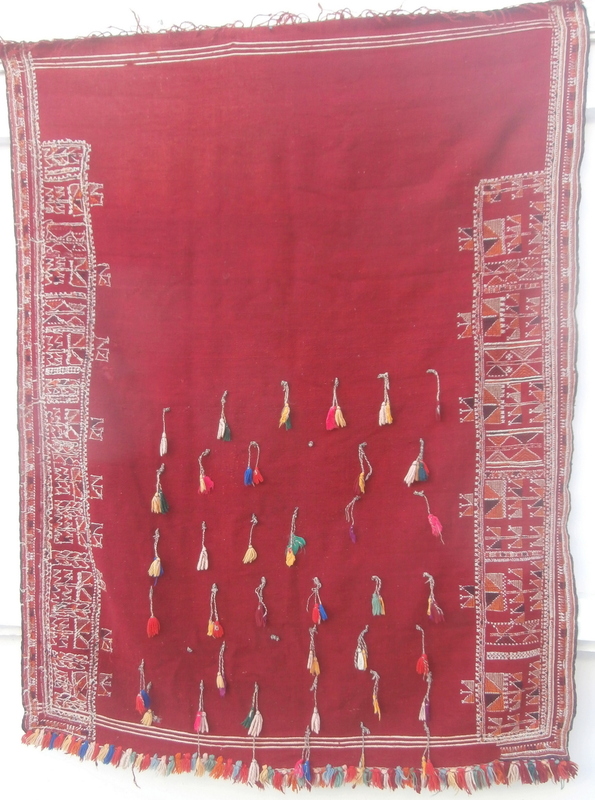 Because of their importance to the family they seldom appear on the market but a very similar piece belonging to the world famous collector of kilims and flat weaves, Alistair McAlpine, appeared at Sotheby in London in 7th June, 2006, Lot 117, and sold for GP Pounds 720. It was classified as mid 20th century (photo available). This piece is older and has a more detailed design and tassels. It is in good condition. There are a few snags to the background cloth commensurate with its serious age. There is good information in the excellent book "North African Textiles" by Spring and Hudson with a map and on pages 34, 48, and 65. Reference 2828. Size 152 z 117cms. 5ft. x 3ft.10ins. Euros 490. 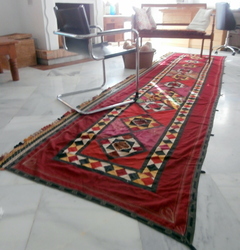 VERY RARE TUNISIAN WEDDING CAPE known locally as a "Bakhnuq" and given as a gift by the groom to his bride. 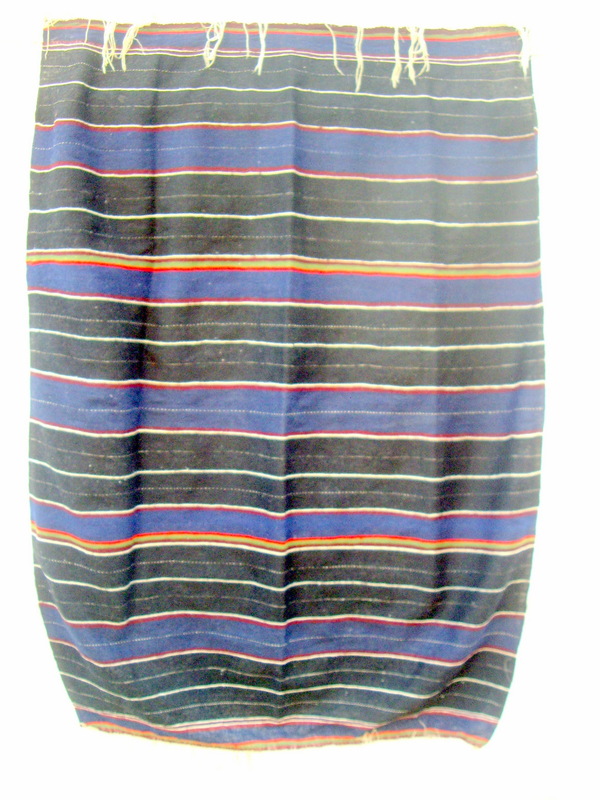 Although bought in Tunis in 1981, these fine capes are woven in the small towns of Cabes and Tataouine in the south east of Tunisia. They are always woven with red, blue or black fine wool and embroidered in cotton with designs which symbolise the bride's jewellery. 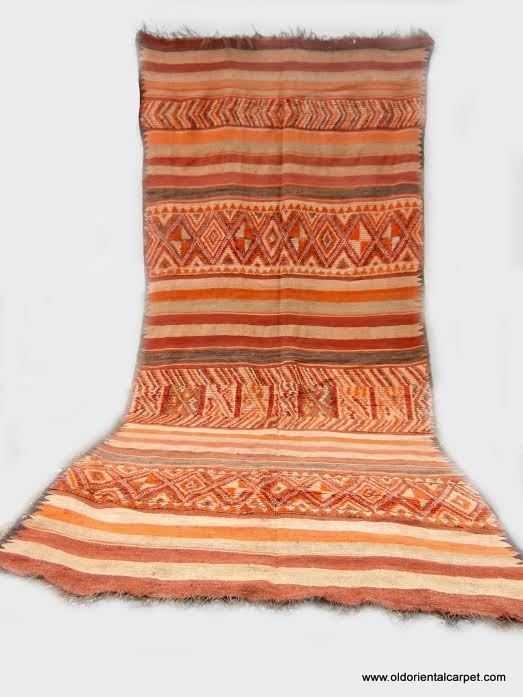 Because of their importance to the family they seldom appear on the market but a very similar piece belonging to the world famous collector of kilims and flat weaves, Alistair McAlpine, appeared at Sotheby in London in 7th June, 2006, Lot 117, and sold for GP Pounds 720. It was classified as mid 20th century (photo available). This piece is older and has a more detailed design and tassels. It is in good condition. There are a few snags to the background cloth commensurate with its serious age. There is good information in the excellent book "North African Textiles" by Spring and Hudson with a map and on pages 34, 48, and 65. Reference 2828. Size 152 z 117cms. 5ft. x 3ft.10ins. CLOSE UP. 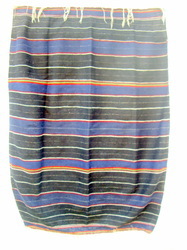 MOROCCAN BERBER CAPE or handira. This is exceptionally fine and is the type of cape worn by girls and women seeking husbands at the annual wedding fair and celebrations in the Middle Atlas mountain village of Imichil every September. The capes are woven to be slightly wider in the centre which means that they fit comfortably around the shoulders. This piece has the original fastening ropes. A similar piece is featured in the text book "Marokko" on page 157. Reference 2685. Size 106 x 88 cms., or 3ft. 6ins. x 3 ft. Euros 175. MOROCCAN BERBER MIDDLE ATLAS FLAT WEAVE. 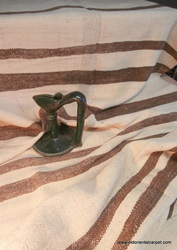 A superb old example which dates from the middle 20th century and is from the Ait Youssi Berber group. 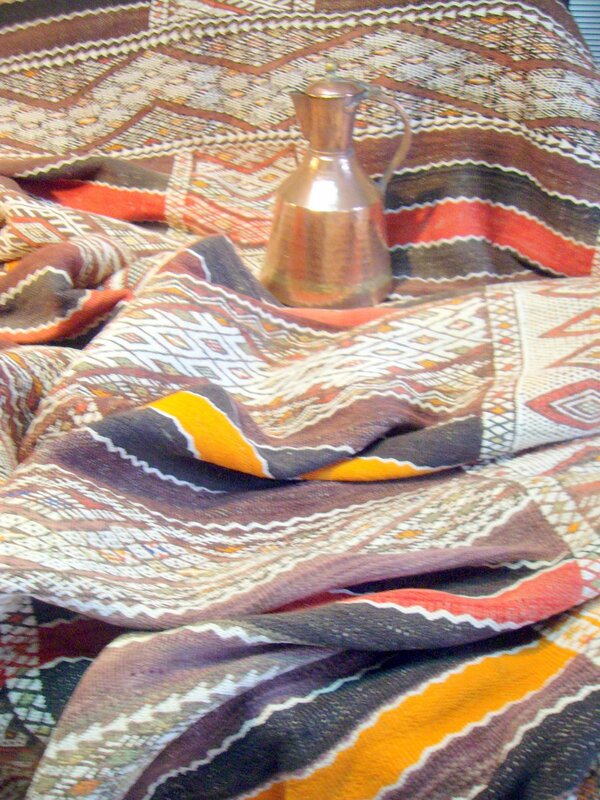 Large flat weaves are known as `Hanbels`and are multi functional inside a Berber hut or tent. They serve as seating for large groups, curtains and covers for communal family sleeping at night. The embroidered designs which cover the surface are intricate and well balanced. 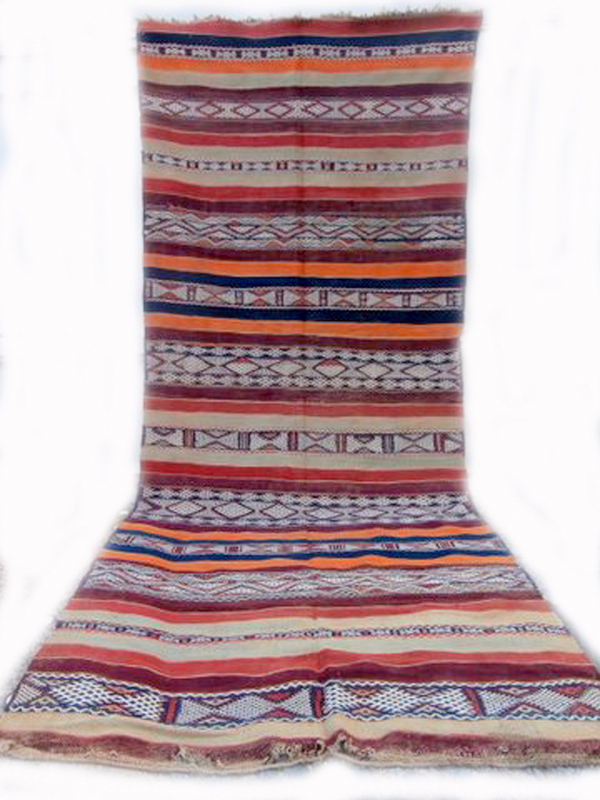 An older saddle cover with simliar designs and overall appearance is shown in `Marokko` by Kurt Rainer on page 135. Ref. 2190. Size 329 x 142 cms. 11ft. x 5ft.10in. Euros 1150. MOROCCAN BERBER MIDDLE ATLAS FLAT WEAVE. 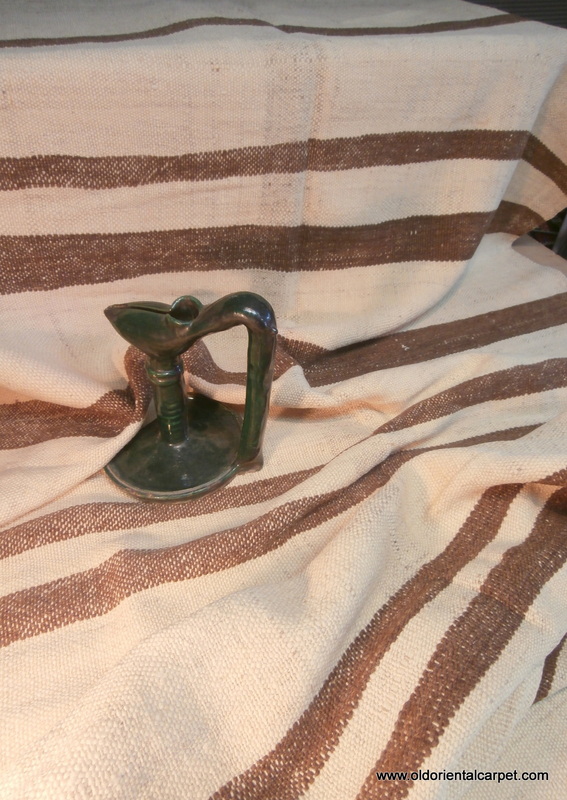 A superb old example which dates from the middle 20th century and is from the Ait Youssi Berber group. 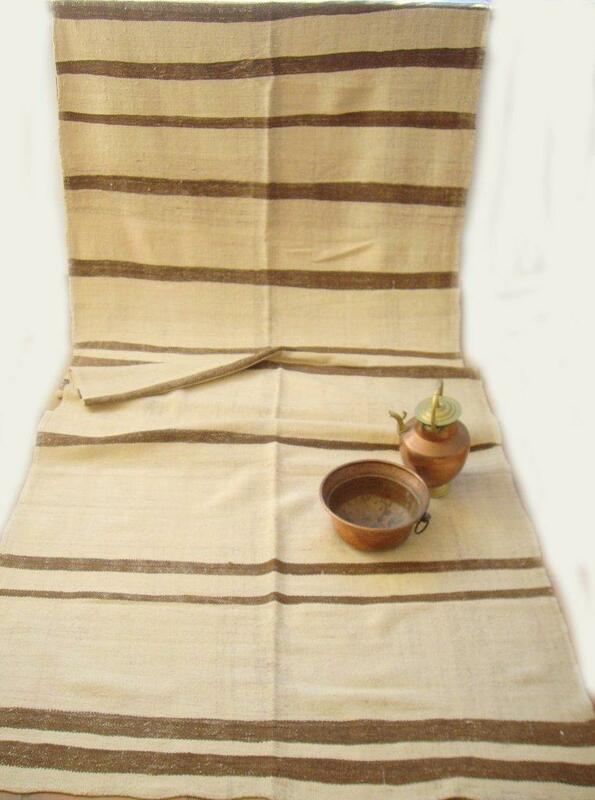 Large flat weaves are known as `Hanbels`and are multi functional inside a Berber hut or tent. They serve as seating for large groups, curtains and covers for communal family sleeping at night. The embroidered designs which cover the surface are intricate and well balanced. 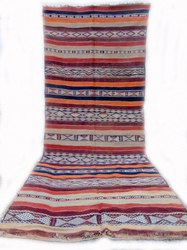 An older saddle cover with simliar designs and overall appearance is shown in `Marokko` by Kurt Rainer on page 135. Ref. 2190. Size 338 x 177 cms. 11ft. x 5ft.10in. CLOSE UP. 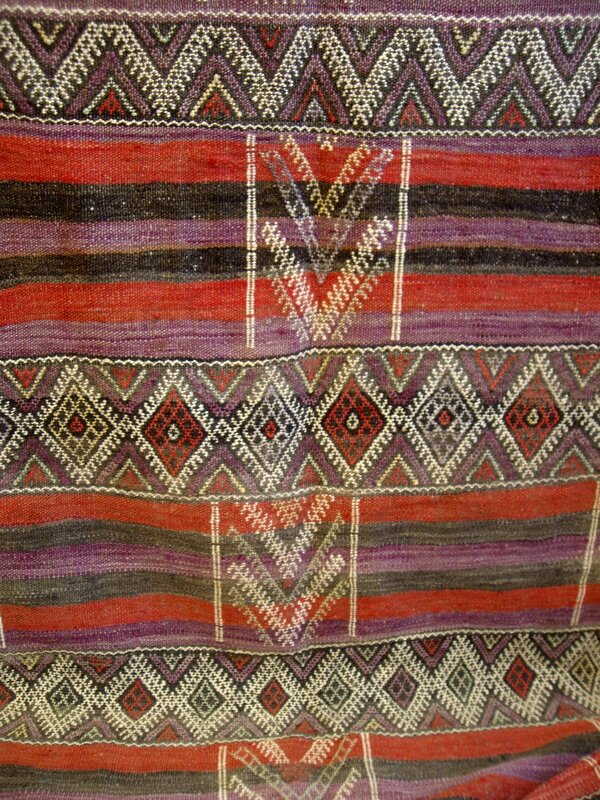 MOROCCAN BERBER MIDDLE ATLAS KILIM / FLAT WEAVE from the region of Zeymour in the western Middle Atlas. The piece is about 30-40 years old and in excellent condition. It is finely embroidered throughout in silk with cotton highlights. 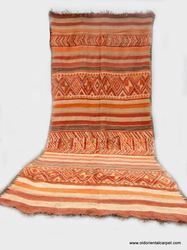 It would probably have been used by a Berber woman as a cape for ceremonial occasions. Reference 2365. Size 145 x 89cms. 4ft.9in. x 3ft. Euros 280. 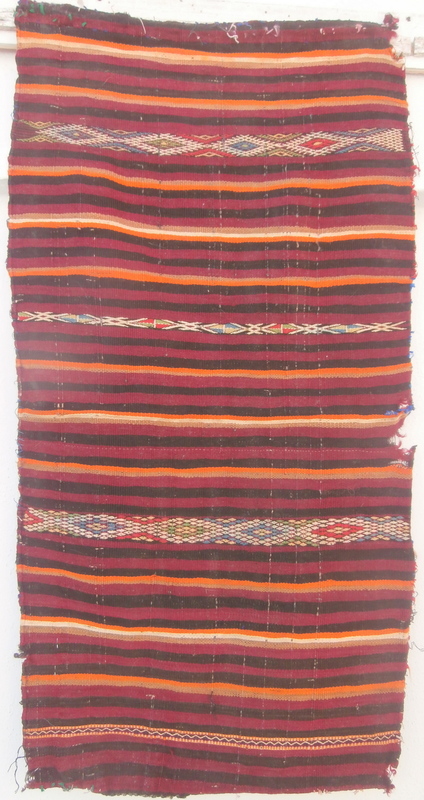 MOROCCAN BERBER MIDDLE ATLAS KILIM / FLAT WEAVE from the region of Zeymour in the western Middle Atlas. The piece is about 30-40 years old and in excellent condition. It is finely embroidered throughout in silk with cotton highlights. It would probably have been used by a Berber woman as a cape for ceremonial occasions. Reference 2365. Size 145 x 89cms. 4ft.9in. x 3ft. CLOSE UP. MOROCCAN BERBER MIDDLE ATLAS FLAT WEAVE. A huge magnificent old Hanbel from the Beni Mtir group of Berbers in the northern Middle Atlas near Meknes. It was probably used as the communal sleeping cover for a Berber family. Reference 2136. Size 429 x 145 cms, 14ft 1ins x 4ft 8ins, Euros 1450. 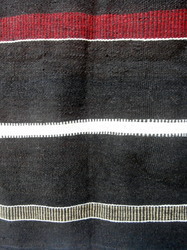 MOROCCAN BERBER MIDDLE ATLAS FLAT WEAVE. A huge magnificent old Hanbel from the Beni Mtir group of Berbers in the northern Middle Atlas near Meknes. It was probably used as the communal sleeping cover for a Berber family. Reference 2136. 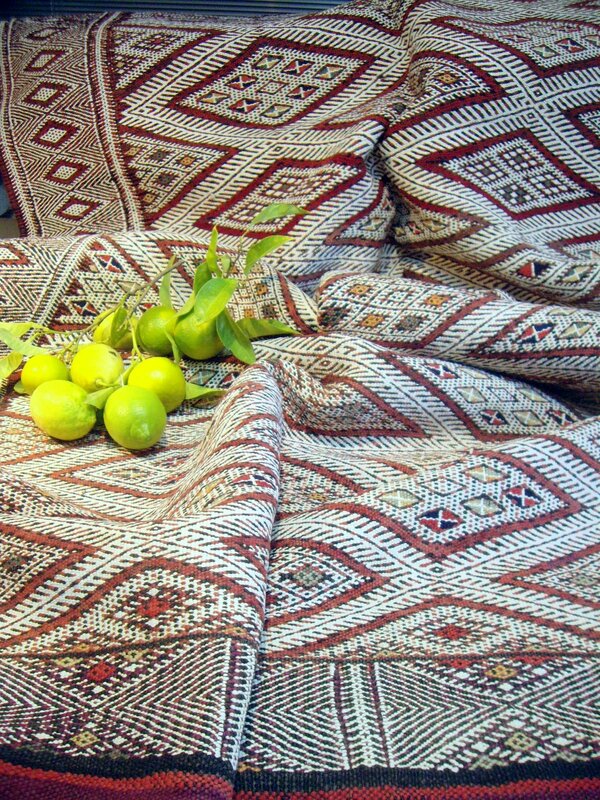 Size 429x145 cms, 14ft 1ins x 4ft 8ins, Euros 1450 CLOSE UP..
SPECIAL OFFER.........MOROCCAN BERBER MIDDLE ATLAS CAPE. 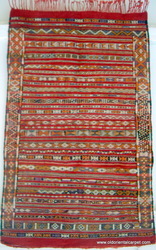 A finely woven example from the region of the village of Imilchil. 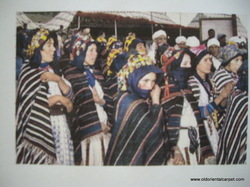 These capes, or "handiras", are worn by women, especially during the annual wedding festival which takes place in September. Authentic capes are partly oval in shape.. Reference 2147. Size approx.176 x 135cms. 5ft.9in. x 4ft.5in. Euros 190. 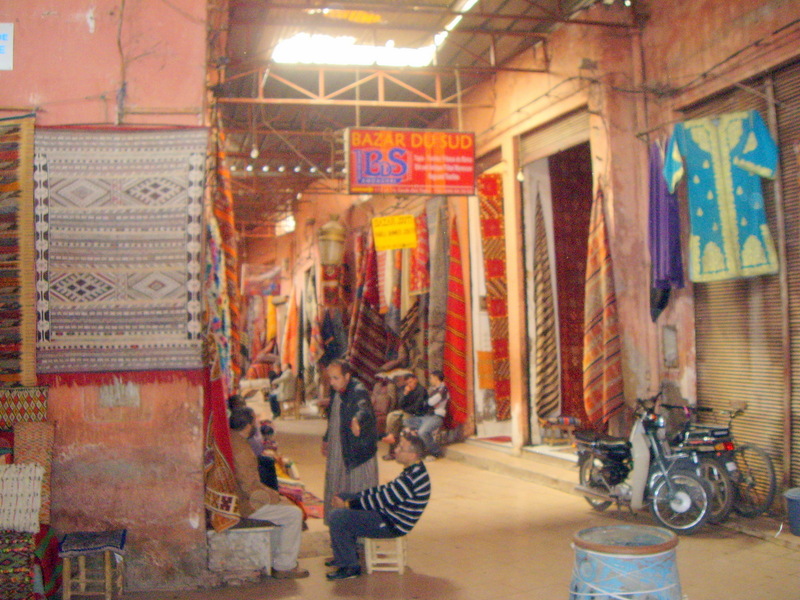 SOMETIMES I find interesting flat weaves and kilims in the Medinas such as this one in Marrakech. 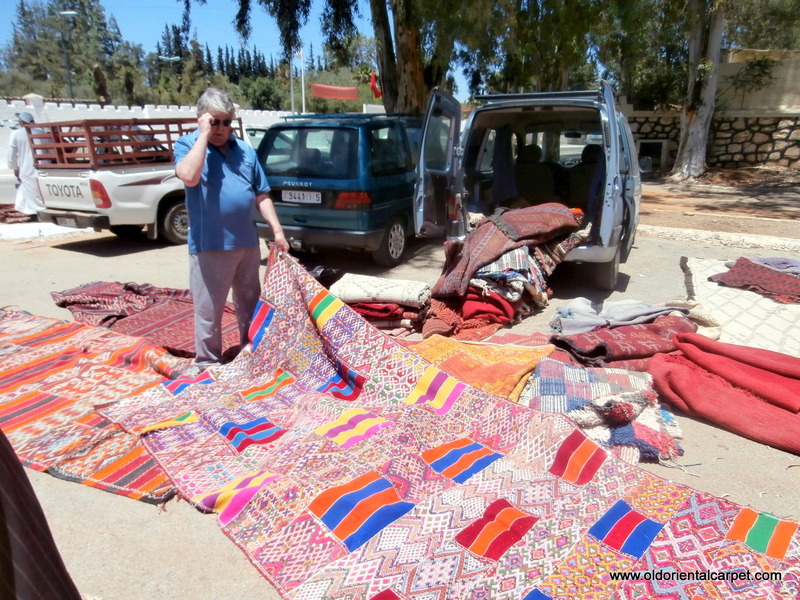 WEEKLY street markets such as this one in the Middle Atlas region of Zemmoor are a great source of kilims and other textiles. 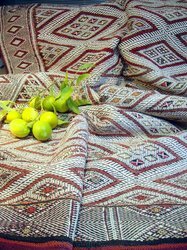 SPECIAL OFFER..........MOROCCAN MIDDLE ATLAS KILIM - This extraordinary flat weave is woven from soft, silky, undyed hand spun Berber wools. It is a very long piece which probably owes its excellent condition to its limited use for ceremony or special occasions. 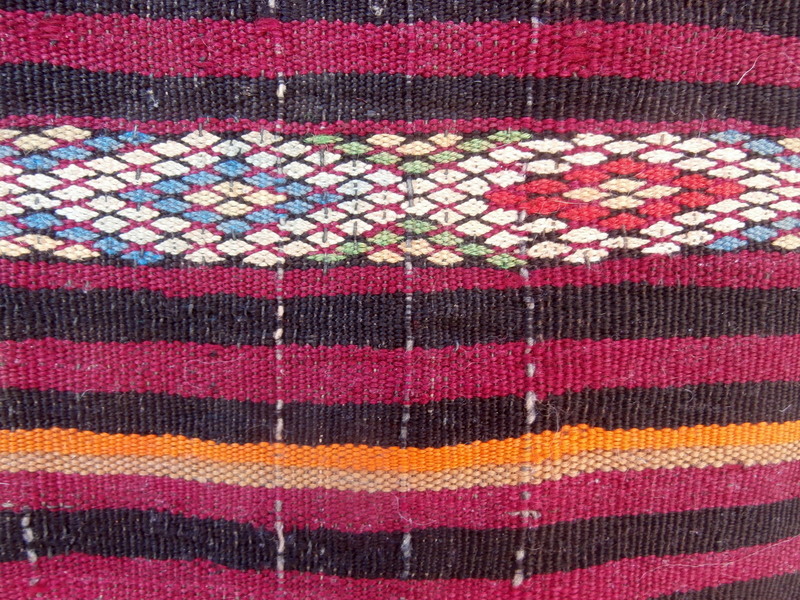 The kilim is from the Ait Youssi Berber group in the western Middle Atlas. Ref. 2153. Size 400 x 126 cms, 13ft 2ins x 4ft 2ins, Euros 475. 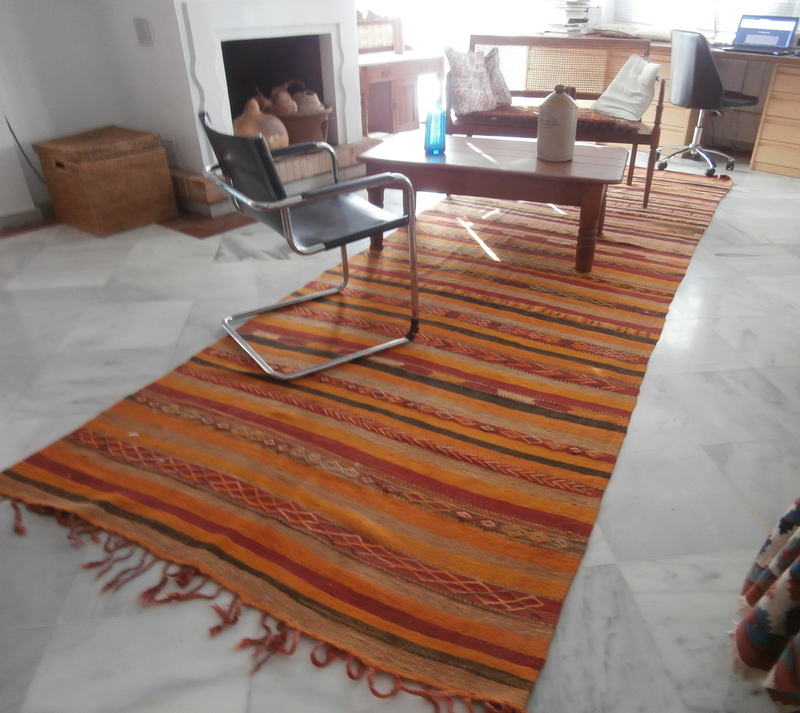 MOROCCAN MIDDLE ATLAS KILIM - This extraordinary flat weave is woven from soft, silky, undyed hand spun Berber wools. It is a very long piece which probably owes its excellent condition to its limited use for ceremony or special occasions. 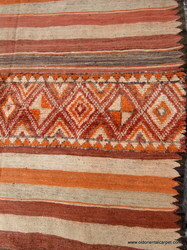 The kilim is from the Ait Youssi Berber group in the western Middle Atlas. Ref. 2153. Size 400 x 126 cms, 13ft 2ins x 4ft 2ins. TENT TRAPPING from Uzbekistan. 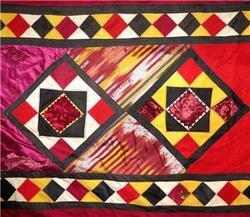 This very long silk embroidered cotton band is called a "Sardevor" and is made up as a patchwork of pieces. It would have been the band which hung at the top of the interior walls of a yurt where they met the roof. It is complete with the original loops used to hang it in place and has a beautiful hand made bottom decorative edge. Although it dates from the mid 20th century and has been used it is in perfect condition. 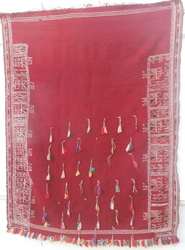 An early 20th century wall hanging using the same technique, and having the same design elements, is shown as plate 400 in the authoratative text book "Uzbekistan" by Johannes Kalter and Margareta Pavaloi. Reference 2955. Size 419 x 97 cms., or 13ft. 8ins. x 3ft. 2ins. CLOSE UP. 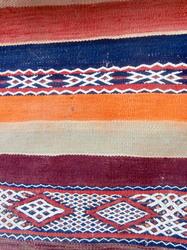 MOROCCAN MIXED TECHNIQUE FLAT WEAVE/KILIM OR "HANBEL". 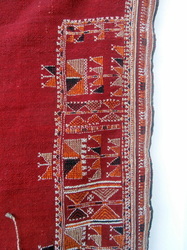 This rare, old hanbel or cover is from the region of Rehamna in the plains of Marrakech. This land lies between that city and extends westwards to the Atlantic Ocean. The weavers are not Berbers but Moroccan Arabs. 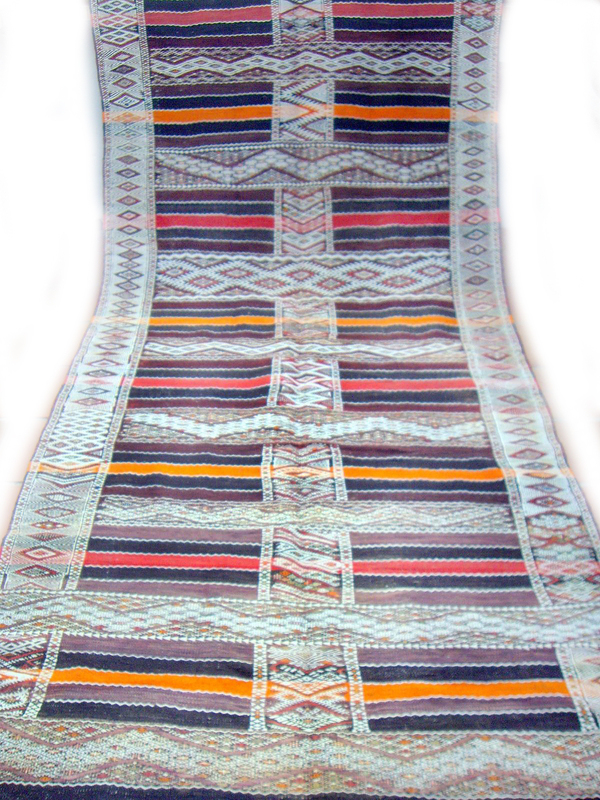 The foundation is a long hand woven kilim of several shades. As the weaver progressed she wove several bands of knotted pile across the field and this is known as mixed technique. 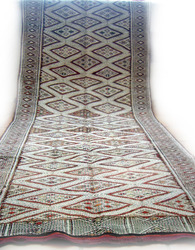 Along each side the carpet has the repeated triangular design which is the traditional finish of much of the Rehamna weaving. 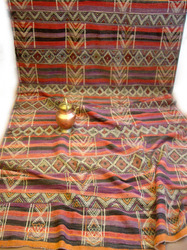 Hanbels are used in tents or dwellings as multi-purpose covers or curtains as well as floor coverings. Two long pieces with similar colourings and designs are shown as plate 62 and 63 in the text book "Maroc - Tapis de Tribus". Reference 2718. Size 340 x 180 cms., or 11ft. 2ins. x 5ft. 3ins. Euros 1580. 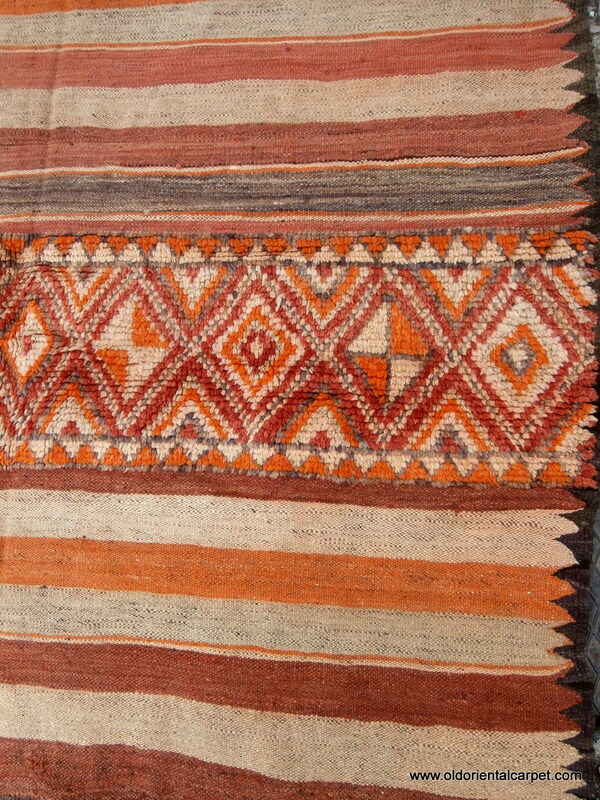 MOROCCAN MIXED TECHNIQUE FLAT WEAVE/KILIM OR "HANBEL". 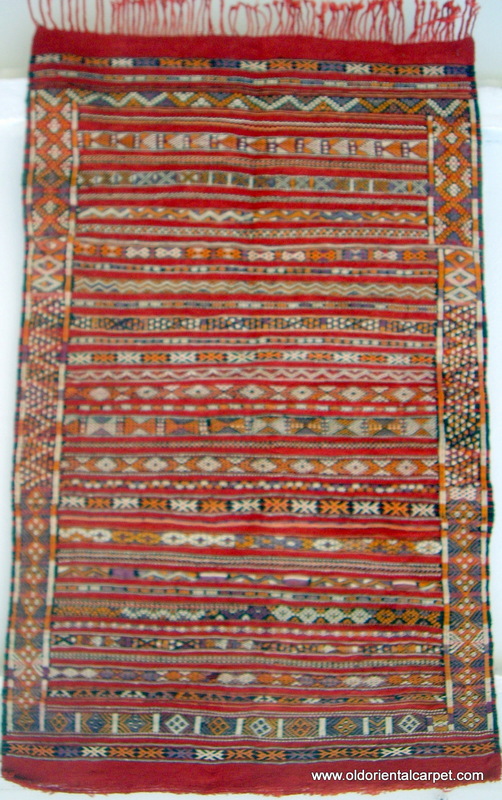 This rare, old hanbel or cover is from the region of Rehamna in the plains of Marrakech. This land lies between that city and extends westwards to the Atlantic Ocean. The weavers are not Berbers but Moroccan Arabs. 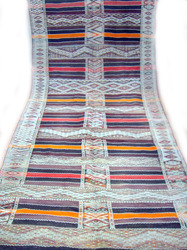 The foundation is a long hand woven kilim of several shades. As the weaver progressed she wove several bands of knotted pile across the field and this is known as mixed technique. 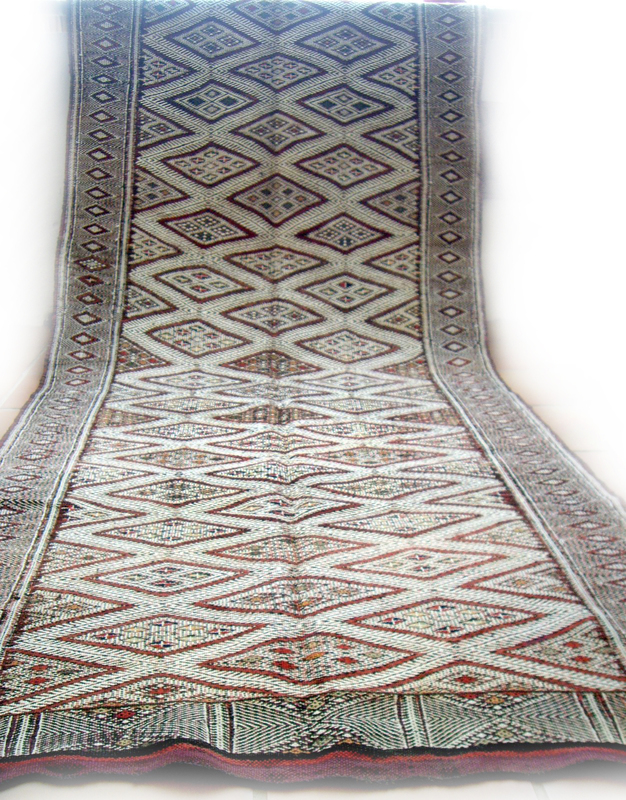 Along each side the carpet has the repeated triangular design which is the traditional finish of much of the Rehamna weaving. 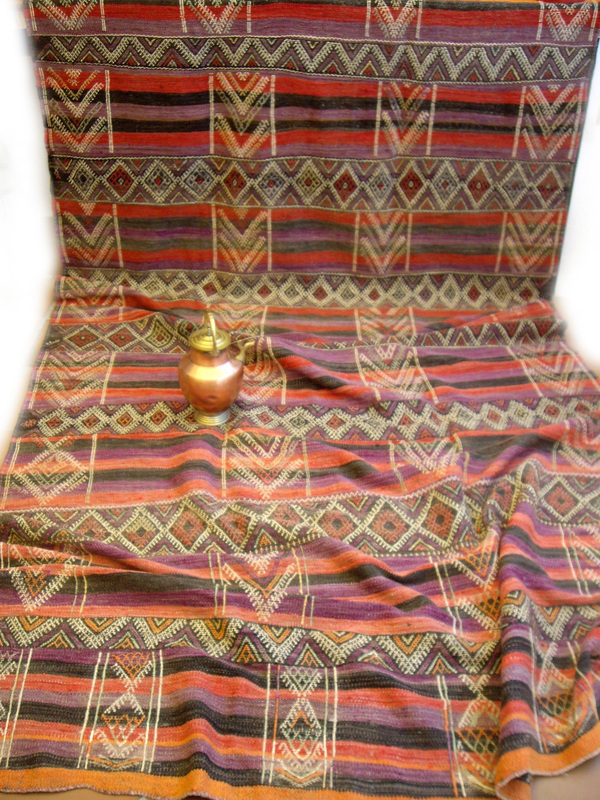 Hanbels are used in tents or dwellings as multi-purpose covers or curtains as well as floor coverings. 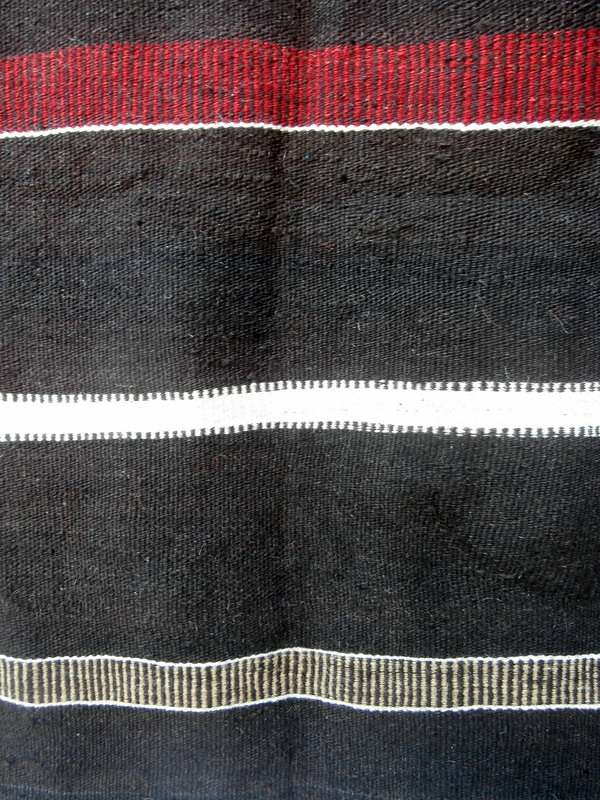 Two long pieces with similar colourings and designs are shown as plate 62 and 63 in the text book "Maroc - Tapis de Tribus". Reference 2718. Size 340 x 180 cms., or 11ft. 2ins. x 5ft. 3ins. CLOSE UP. 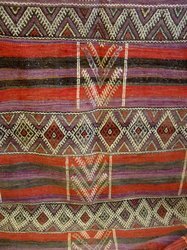 MOROCCAN BERBER EMBROIDERED KILIM, the colours and weave of which indicate that it was woven by the Beni M�guild Berbers in the Middla Atlas. It is old and very fine and was probably a dowry weaving before being folded in half, stitched and filled with stuffing, and spending its working life as a day time cushion and night time pillow. It will make a fascinating wall hanging or table cover. Reference 3037. Size 88 x 47 cms., or 33 x 19 inches. Euros 70. CLOSE UP showing the weave and one of the four very fine bands of embroidered design which are spaced across the whole width. MOROCCAN MIDDLE ATLAS BERBER FLAT WEAVE / KILIM. 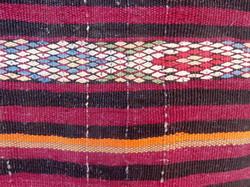 The Ait Arfur Berber group weave distinctive patterns embellished with white cotton on many of their kilims, capes and bags. This is a good example of a large hanbel, or cover, and it was probably used for warmth in the cold mountain winters. It is an old piece in impeccable condition. Ref. 2236. Size 340 x 150cms, 10ft x 5ft, Euros 1185. MOROCCAN MIDDLE ATLAS BERBER FLAT WEAVE / KILIM. 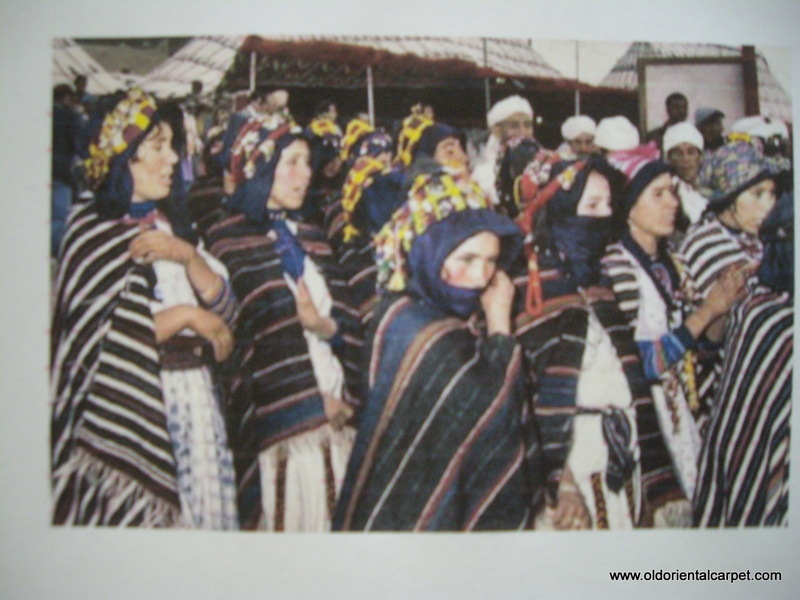 The Ait Arfur Berber group weave distinctive patterns embellished with white cotton on many of their kilims, capes and bags. This is a good example of a large hanbel, or cover, and it was probably used for warmth in the cold mountain winters. It is an old piece in impeccable condition. Ref. 2236. Size 340 x 150cms, 10ft x 5ft. CLOSE UP. 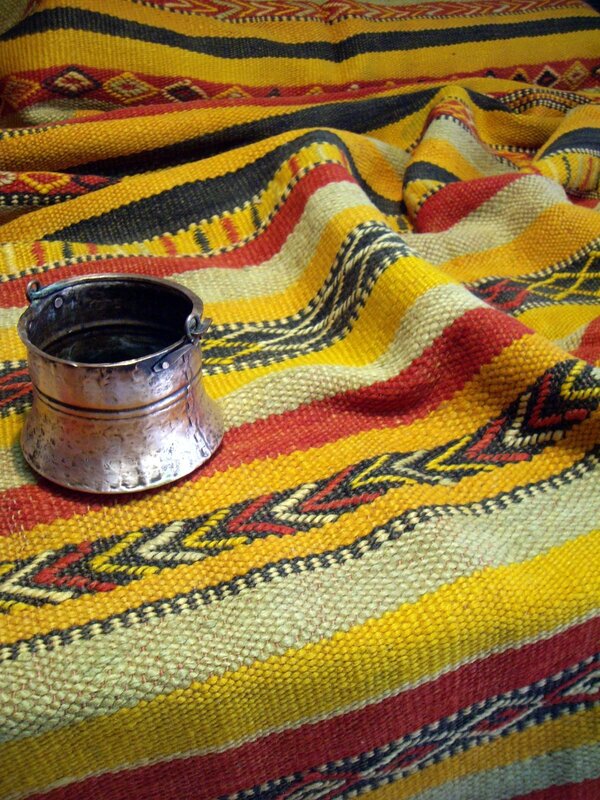 MOROCCAN BERBER MIDDLE ATLAS FLAT WEAVE/KILIM. 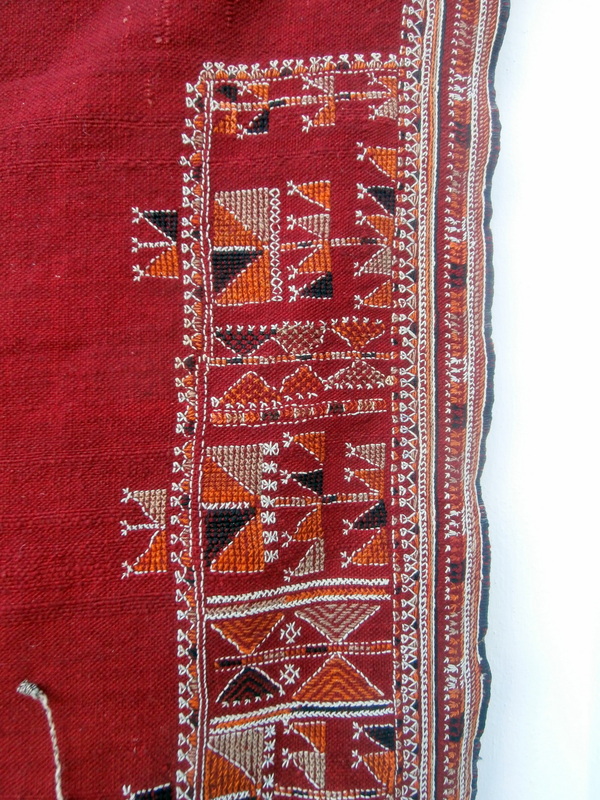 An old beautifully embroidered `hanbel`or cover from the Ait Arfur Berber group in the Middle Atlas. The intricate white designs are created by the use of cotton. The condition is excellent. Ref. 2233. Size 291 x 120 cms, 9ft 6ins x 4ft, Euros 865. MOROCCAN BERBER MIDDLE ATLAS FLAT WEAVE/KILIM. 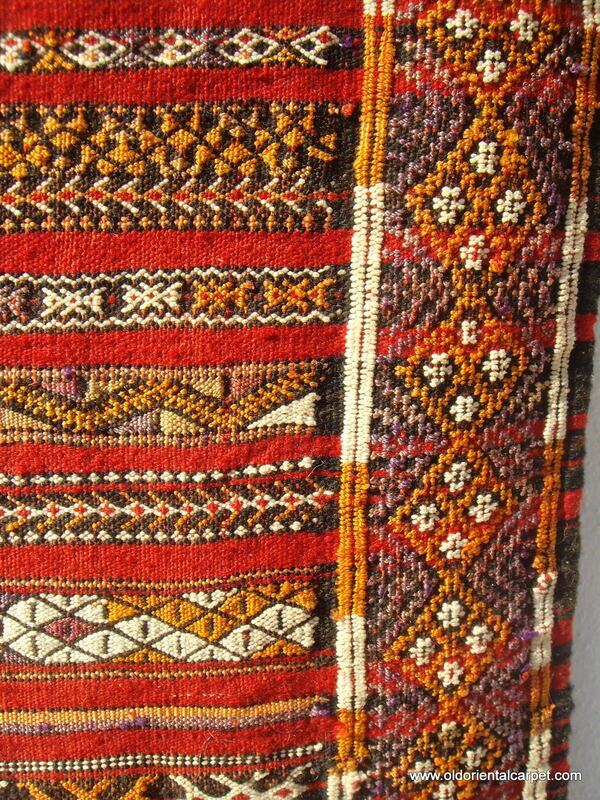 An old beautifully embroidered `hanbel`or cover from the Ait Arfur Berber group in the Middle Atlas. The intricate white designs are created by the use of cotton. The condition is excellent. Ref. 2233. Size 291 x 120 cms, 9ft 6ins x 4ft. CLOSE UP. 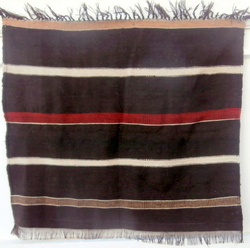 MOROCCAN BERBER HORSE COVER woven with three shades of undyed goat hair and containing one narrow decorative band of madder colored hand spun wool. After crossing the High Atlas mountain range south of Marrakech and the lesser range called Djebel Siroua you enter the land known as the pre Sahara. Vegetation is sparse and the durable goat replaces the sheep for meat, skin, milk and hair. 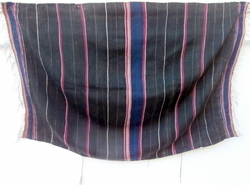 Goat hair is very durable and is used for flat weaves such as this piece. Their squarish shape allows for versatility in the home and they can be small floor coverings, table cloths, wall hangings and can be draped over a bench. Reference 2826. Size 120 x 139 cms., or 4ft. x 4ft. 7ins. CLOSE UP. 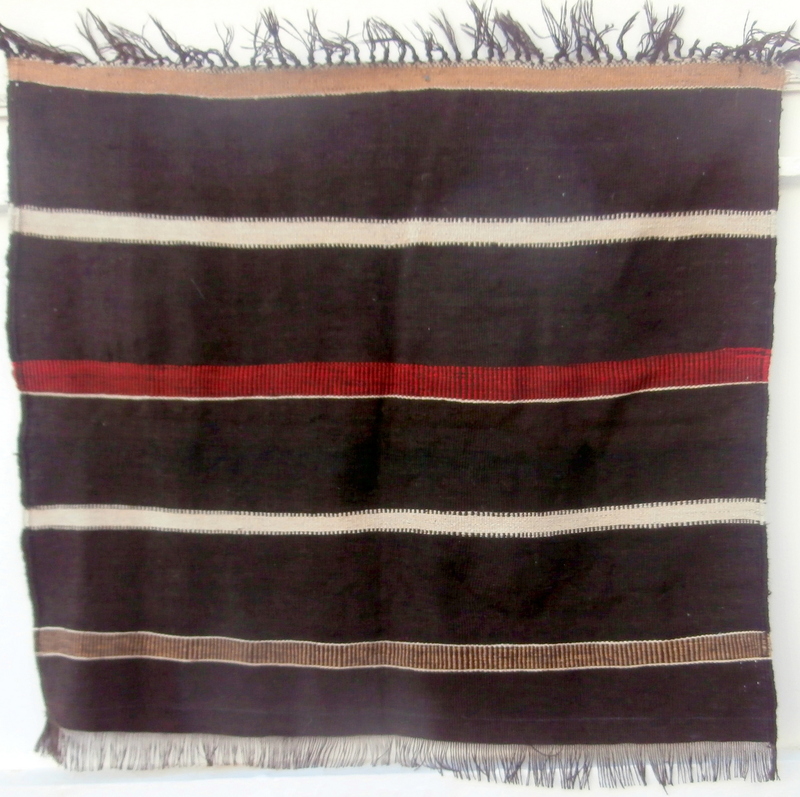 SPECIAL OFFER.............MOROCCAN BERBER HORSE COVER woven with three shades of undyed goat hair and containing one narrow decorative band of madder colored hand spun wool. After crossing the High Atlas mountain range south of Marrakech and the lesser range called Djebel Siroua you enter the land known as the pre Sahara. Vegetation is sparse and the durable goat replaces the sheep for meat, skin, milk and hair. Goat hair is very durable and is used for flat weaves such as this piece. Their squarish shape allows for versatility in the home and they can be small floor coverings, table cloths, wall hangings and can be draped over a bench. Reference 2826. Size 120 x 139 cms., or 4ft. x 4ft. 7ins. Euros 170. 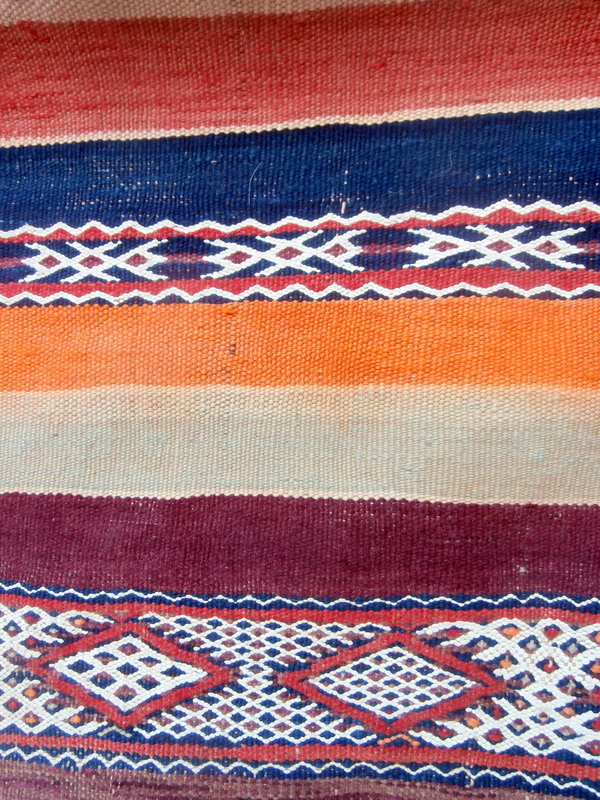 MOROCCAN BERBER FLAT WEAVE/KILIM. 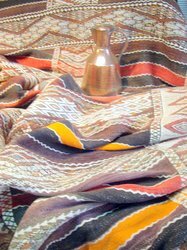 The rich shades of purple, henna, tan, madder and indigo identify the fine old kilim as the work of the Beni M�guild Berbers of the southern part of the Middle Atlas. 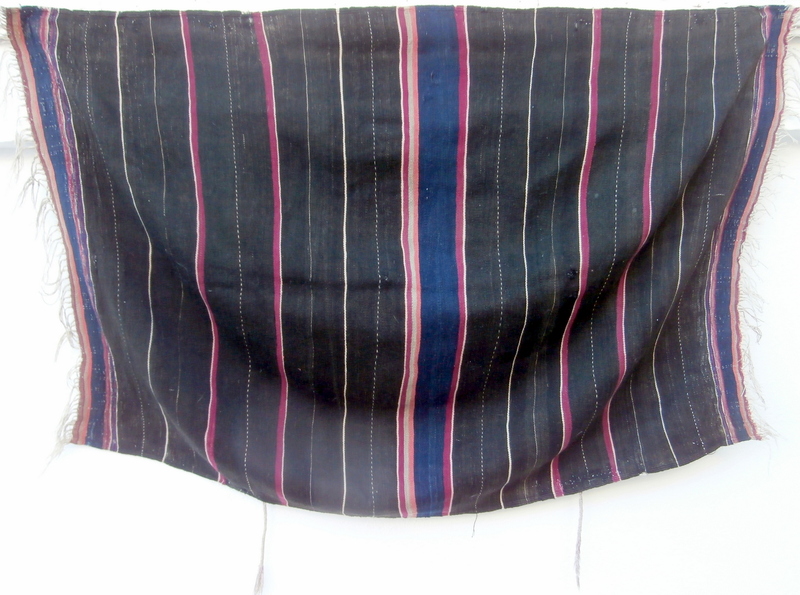 The bands of flat weave are mixed with strips of intricate designs which combine to make this old piece very attractive. Reference 2196. Size 329 x 142 cms., or 11ft 5ins. x 4ft. 8ins. CLOSE UP. 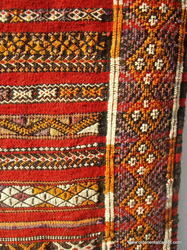 MOROCCAN BERBER FLAT WEAVE/KILIM. The rich shades of purple, henna, tan, madder and indigo identify the fine old kilim as the work of the Beni M�guild Berbers of the southern part of the Middle Atlas. 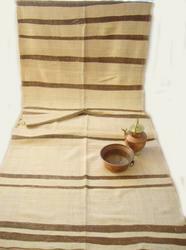 The bands of flat weave are mixed with strips of intricate designs which combine to make this old piece very attractive. Reference 2196. Size 329 x 142 cms., or 11ft 5ins. x 4ft. 8ins. Euros 1180.